ZGestión is a development that has been conceived with the idea in mind of being able to manage and control a full range of aspects of a Spanish company, including the products and their families, and the creation of all kinds of paperwork (orders, delivery notes, invoices, estimates, expenses receipts, sales receipts,...), from a very appealing and simple environment, that makes the job easier. 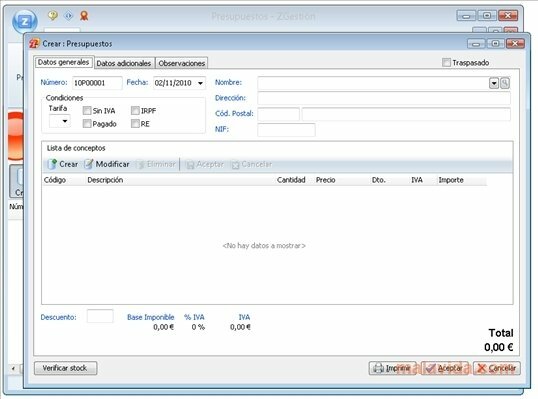 The program is totally configurable, allowing the users to create their own database with the suppliers, clients and products necessary, as well as being able to change the values of the taxes that are applied to the commercial transactions. 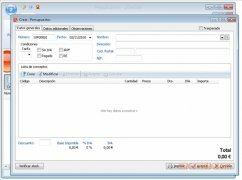 The application uses the acclaimed Ribbon interface (that has become famous due to developments like Microsoft Office), that integrates perfectly with Windows and offers the user a lot of freedom when it comes to handling the program. One of the most practical functions is the one that offers you the option to export any document in PDF format, in such a way that sharing it is as easy as possible. 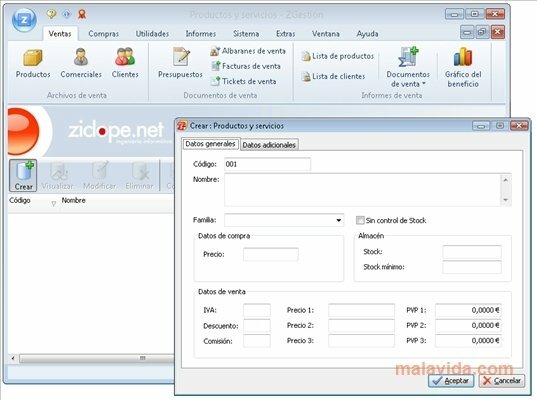 Download ZGestión and discover a great solution to be able to control a company's accounts.